What is AEB and how does it work? | What Car? What is AEB and how does it work? What if we told you there’s a safety feature that could save your life, and it costs car manufacturers as little as £40? Wouldn’t you want that technology on your next car? Autonomous emergency braking (AEB) is becoming increasingly common on new cars. Leading safety experts rate AEB as one of the most important road safety advances of recent years and as important as seat belts. Euro NCAP tests whether a car has AEB or not, and how sophisticated the system is, as a key part of its assessment of every new car. The organisation’s secretary general, Dr Michiel van Ratingen, says: "Vehicles designed to perform well in these tests are better equipped to prevent thousands of needless deaths and life-changing injuries on European roads." Thatcham Research, automotive safety (and also security) experts, believe AEB has the potential to make a bigger impact on road safety than electronic stability control systems (ESC). "ESC helps prevent single-vehicle crashes where the driver loses control," says Matthew Avery, director of research at Thatcham. "Front-to-rear impacts are much more common; in fact they make up around a quarter of all crashes." An AEB system can prevent this type of crash, or at least reduce the severity of such an incident. The most basic AEB systems work at low speeds to prevent or reduce the severity of minor urban collisions. More sophisticated systems work across a wider speed range, so they protect against more serious accidents where there is the potential for severe injury or death. The very best systems – those that earn the most points in Euro NCAP tests – can detect cyclists and pedestrians as well as cars. Whatever their level of sophistication, all AEB systems use sensors to detect obstacles ahead and assess whether a collision is likely. The unit will usually start by warning the driver that a collision is likely and that they need to brake, using dashboard warning lights or an audible alarm. If the driver fails to take action, the ‘autonomous’ part of the system will kick in and apply the brakes automatically. These systems, which take technology used in adaptive cruise control and apply it to improve safety, have been around for more several years. 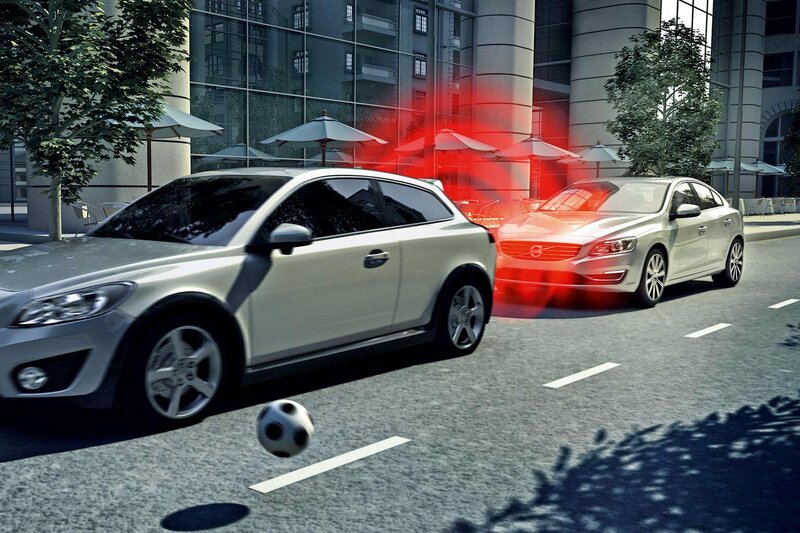 Volvo was one of the pioneers, launching the XC60SUV with a system called City Safety in 2008. As the name implies – and like most early AEB systems – City Safety was developed for urban driving at low speeds. Operating from just over 2mph to just under 19mph, the first generation of City Safety was designed to prevent collisions entirely if the difference in the speed of the two vehicles involved was no more than 9mph. If there was a greater difference in closing speed the system would reduce the severity of an impact, although it wouldn’t prevent it completely. So, its aim was to prevent whiplash and relatively minor injuries, rather than to save lives in higher speed collisions. However, in spite of the limited circumstances in which this system was designed to operate, when Thatcham compared the XC60 with other similar SUVs without AEB it found a 23% reduction in crashes. Technology has moved on a great deal since 2008. The original City Safety system used a LIDAR (light detection and ranging) sensor. Now AEB systems use radar and cameras or a combination of both to offer braking from higher speeds and much greater sophistication. "Software has improved and car makers now have more confidence in their systems," explains Avery. Today’s AEB systems aren’t only smarter, they also brake harder. Instead of the 0.5-0.6G of braking force delivered by an early AEB device, modern systems can deliver around 1G. Why should I spec AEB on my next car? Simply because it works. One study by the US insurance industry compared the effectiveness of AEB with other driver assistance and collision avoidance technologies. For cars fitted with AEB systems, it found that insurance claims to repair damage done by the studied car to another vehicle were reduced by 10-14%. In contrast, the fitment of lane departure warning systems had little effect on insurance claims. Research by the University of Adelaide in Australia examined 104 crashes, and used simulations to estimate how AEB could have reduced collision speeds and the risk of injury. It concluded that AEB could reduce fatal crashes by 20-25%, and that crashes where injury occurred could have been reduced by 25-35%. Thatcham has also closely monitored the effectiveness of AEB. Comparing the Volkswagen Golf Mk7, which has AEB fitted as standard to all but the entry-level S trim, with the previous Mk6 model, Thatcham found there was a 45% reduction in crashes where injuries occurred. What about pedestrians and cyclists? A significant benefit of the latest AEB systems is their ability to protect vulnerable road users. That’s been made possible by a change in the type of sensors used. Today’s most advanced AEB suites typically employ radar and a camera, or in the case of Jaguar and Land Rover’s latest offering, a 'stereo' system with two cameras. "A radar is good at identifying where something is, its rough size and its metallic content. It’s not good at identifying what an object is," says Avery. "Cameras are really good at identifying whether an object is a car, a person or a cyclist, although they’re not very good at working out where they are." Combining the two technologies (or using more than one camera) allows objects to be precisely located and identified. "You can then introduce algorithms that predict where the object is going and whether it is likely to move into the path of the car," Avery explains. In other words, the best AEB systems can now tell the difference between a person, a bike and a car. In addition, they understand that people, cyclists and motor vehicles can be expected to behave differently from one another. Since the beginning 2016, Euro NCAP has included an assessment of a car’s ability to recognise, brake and avoid pedestrians in its overall safety rating. From 2018, a similar test will be introduced around cyclists. These changes mean cars without a camera-based AEB system will find it increasingly difficult to achieve Euro NCAP’s coveted five-star overall safety rating. Why don’t all cars have an AEB system? Good question. While it might be difficult for small-volume car manufacturers to engineer such technology into their vehicles, the cost of off-the-shelf AEB units from automotive technology suppliers is not expensive. Avery estimates that manufacturers can buy a LIDAR-based system for around £37. A camera-based system might cost approximately £58, a stereo camera system £73 and a radar-based system around £146. Part of the problem lies with the driving public. Big alloy wheels, touchscreen infotainment systems and panoramic sunroofs all have more showroom appeal than safety technology that you can’t see or touch, and that you hope you’ll never have to use. On new cars with an AEB system as a cost option, just 1.6% of buyers will tick the box to choose it. That’s why Thatcham and Euro NCAP want manufacturers to fit AEB as standard. To encourage them to do so, they are offering the incentive of a higher Euro NCAP score for these models. This will also help to lower insurance premiums for their owners, as Avery explains: "Cars with AEB systems as standard have around 10% lower premiums." However, the discount isn’t given to cars with optional AEB because it’s too difficult for insurers to verify whether the system is fitted. The smartest car manufacturers are packaging AEB with other technology that uses the same sensors, such as traffic sign recognition and high-beam control. In this way they are mixing safety with comfort and convenience features, which drivers can benefit from in everyday driving, not just in an emergency. The evidence is irrefutable – AEB systems save lives. Just as all new cars now come with stability control, so autonomous emergency braking should be standard-fit for all mainstream cars.